Introducing Gaia's Ceremonial Cleansing Kit, a sacred, cleansing, purifying, spiritual tool kit for home, ceremonies and more. Our bundles of Palo Santo, White Sage and Abalone Shells are blessed within the energies of the Unified Field of Pure Consciousness. Comes with a Ceremony written by the First Contact Ground Crew Team of MotherGod. Native Americans have passed on this tradition for generations. 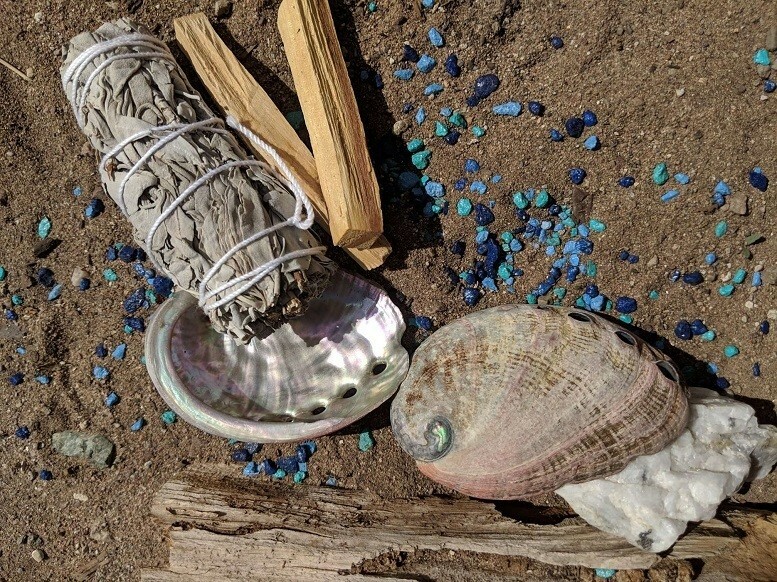 The use Sacred Sage, which represents the Divine Feminine energies, helps cleanse any space from negative energies and used in ceremonies to seek blessings of protection, healing, prosperity and balance.We recommend the use of white sage for all your cleaning needs and the scent itself is amazing. Palo Santo is known to clear the energies of your auric field and home. In addition, Palo Santo is traditionally used for relieving headaches, migraines, common colds, flu symptoms, stress, asthma, anxiety, depression, inflammation and more. Give it a go! This journey here on Earth is about coming into balance, this means balancing our Masculine and Feminine within. Consider our selection of White Sage, which represents the Divine Feminine energies and our Palo Santo, which represents the Divine Masculine to create the perfect atmosphere for internal balancing. A powerful combination for any home.